At or In the __________, I_________. In the mornings, I take care of Coco and Kiki. I fluff their seeds, refresh their water, talk with them and watch them snuggle. It's rather difficult to get a focused photo of these two cuties! It's a morning ritual that is rewarding! What a sweet and wonderful way to start your day. Have a good weekend. A sweet couple you share mornings with! I just love seeing these two! I bet they look forward to the morning ritual too! Oh! These are cute little birds! I bet the love your attention. They are so cute!!!!! What a gorgeous little pair! And in focus too! Hard to get things in focus when there's something in between. Lovely shot. Love your morning routine! 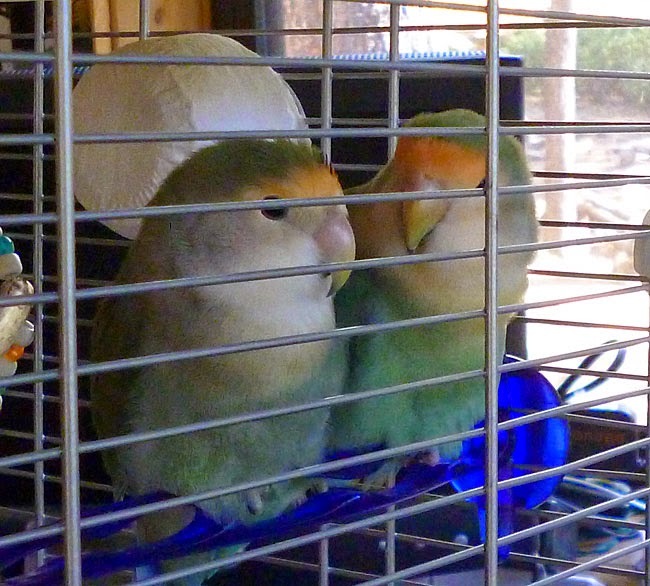 It seems perfect to have two birdies so they have a feathered chum. Also really appreciate your Memorial Day post.